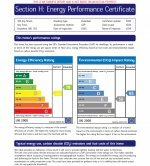 Energy Performance Certificates for Domestic,Commercial & rental properties, in Leicestershire. DECs in Leicestershire. Do you require an EPC in the Leicester.Loughborough and the Melton area fast ? . Then we can help you,we can make the same day appointments and assess your property the same day, and produce the EPC within 24hrs or if all the information is available to us that day. We can save you up to 30% on the cost of your estate agent performing the same task also it could take up to a week for them to send someone like me to do the EPC which will delay your sale. The EPC will be emailed direct to your agent on your request. So for a hassle free service don't delay call us today. Copyright FEP Energy 2019 All rights reserved.